Custom token for the trading card game "Magic the Gathering". Oh wow, now this is beautiful! Хоспаде, орать не остановиться. хотел бы я такой токен себе. Wow, this is beautiful! 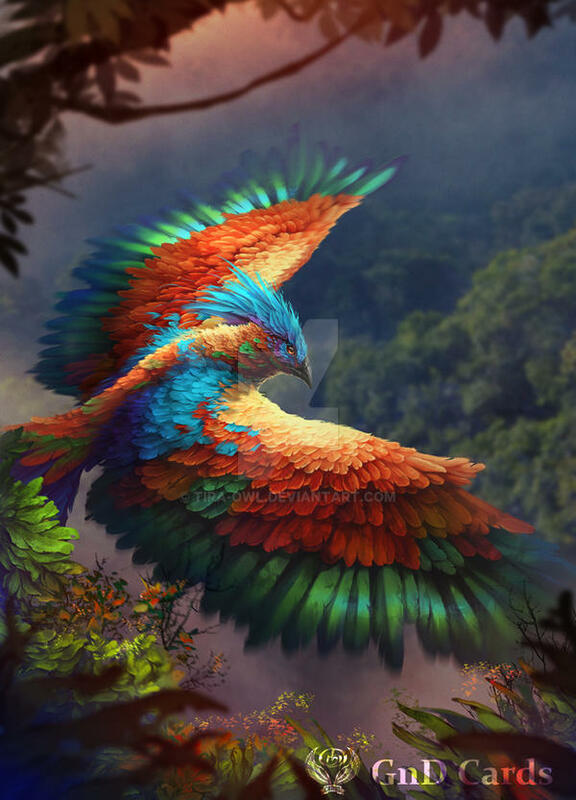 All the amazing details and colouring on the feathers, and the absolutely beautiful background, are all fantastic. Wow, absolutely gorgeous! I love the brilliant usage of color and perspective that you've used! This is so beautiful. Wow! Oh how cool! Beautiful art. (My husband plays MTG) Congrats on the DD! A birds of paradise token? OP! OP! What was the color values that you used by the way congrats on your DD! Reminds me of a bird from a folklore in our country. Wonderful work! love the colours here! Wow very epic. So love this piece. Very vibrant. Veery Beautiful! So many colours! неймовірно класна яскрава робота. Ви надихаєте! Really stunning work! Everything looks so gorgeous! Wow, gorgeous work. Looks celestial. Wow -beautiful! Especially the coloring. Gorgeous colors, gorgeous shading, gorgeous job!